There. I had to get the hashtags in right off the bat in the hopes someone will actually read this. In case you missed it, the Journal broke a story last week that went viral and wound up re-reported by publications from the New York Times and Vanity Fair to Golf Digest and the Hollywood Reporter. On one level, it was quite a phenomenon to behold. We posted a story to our website at about 3:45 p.m. on Feb. 1, noting that a woman — Rebekah Martinez — listed on the California Attorney General's database of missing persons out of Humboldt County is currently a contestant on the hit television show The Bachelor, which airs on ABC and draws millions of viewers. We knew it was only a matter of time before the story went viral. It checked all the boxes — the man-bites-dog element of the unexpected with someone missing on national television and the inclusion of a celebrity — one who also happens to be young, female and objectively attractive. Add in the detail of a Humboldt County pot farm, and the story was click-bait gold. It was still fascinating to watch it unfold. Virtually all the reporting linked back to our coverage, and we watched our website numbers soar as hundreds of thousands of people who had previously been arguing about whether Martinez — known as Bekah M on the show — was too young to make out with Arie the bachelor, let alone marry him, flooded to read our coverage. Now don't get us wrong, the clicks are nice and there's something intoxicating about a piece you produced capturing so much attention. But we're also keenly aware that this story captured all this attention for all the wrong reasons. Its popularity was a by-product of our celebrity-obsessed, reality-TV culture. And there was similarly little, if any, examination of what this story says about our law enforcement agencies and their missing persons databases, or the general embarrassment of both ambling along totally oblivious to the fact that one of their listees was posting to Instagram and appearing on national television. Now please don't read this as an indictment of the Humboldt County Sheriff's Office, which we realize has 4,000 square miles to patrol with limited staff and funding, not to mention a seemingly ever-increasing pile of confirmed homicide cases to investigate. But it should be impossible to read Martinez's story and our coverage of missing persons cases in general without seeing that there are some very real flaws that need to be addressed if we as a community are really going to do all we can to find the missing. And that's what this conversation should be about, right? 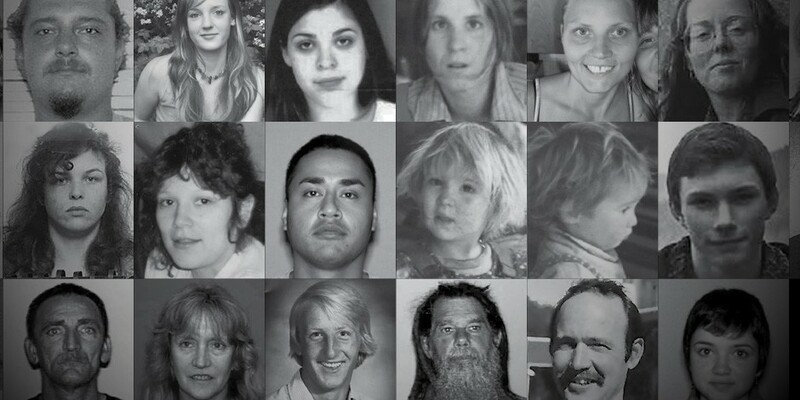 There are people in this community who disappeared, seemingly without a trace. They left behind people who love them, people whose lives will be dominated by their absence and unanswered questions. This issue of the North Coast Journal is about them.